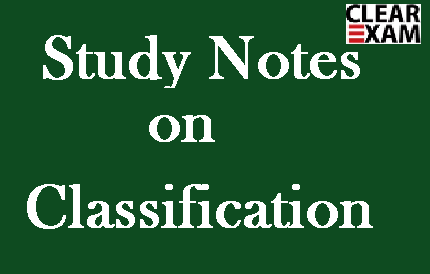 Here we are providing you Study notes on Classification which will be helpful for Upcoming CTET and DSSSB Exams. The Classification is a process of dividing various objects into Groups on the basis of the properties common to them. The classification helps us to make a homogeneous group from the given heterogeneous groups. In this type of questions, you should classify the given words according to the relationship between those words. It would be very easy to classify some given words or to find the odd word out from the given alternatives. The essential trick is to find out the basis of similarity between the words. The dissimilar (odd) word, would then stand out, itself. Example: Four of the following five are alike in a certain way and so form a group. Which is the one that does not belong to that group? Answer. Except Anger, all other are specific feelings. Sometimes we are given a group of letters (non-meaningful words) and we are asked to find the odd letter-group out of them. Now let's have a look at some Example problems so that you can get the basic view of the Classification Problems. Example: In the following questions, four groups of letters are given. Three of them are alike in a certain way while one is different. Choose the odd one. In all other groups, the first and second letters are moved 4 steps backwards to obtain second and third letter respectively.